When I read Ernest Cline's Ready Player One a few years ago, I ended that read-through with a smile on my face. I found the book to be a lot of fun and a quirky celebration of geek culture with a boatload of obscure references to various bits of pop culture. If anything, it mostly felt like a book that was meant to be a movie should anyone figure out the complex licensing requirements needed to pull things together. Ready Player One now exists as a movie and it seems everyone and their dog are deteremined to poke holes in it for one reason or another. And while the source material wasn't exactly perfect, I don't necessarily think all the virtriol and backlash is fully warranted. I wasn't sure what to expect from this movie when the trailers first hit, but I was pretty optimistic. The team behind it seemed like the right mix of talent to see things through and the final result was pretty fun. 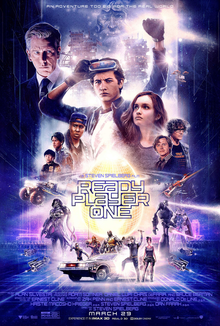 Synopsis: Ready Player One is an American science fiction adventure movie produced and directed by Steven Spielberg. The screenplay was written by Zak Penn and Ernest Cline as based on Cline's novel of the same name. It's 2045 and Earth's poor end up in places like the stacks, which are really just vertical trailer parks for the poorer members of society. But what everyone does to escape the depressing nature of their lives is to venture into the OASIS, a virtual reality environment created by James Halliday (Mark Rylance). Apart from creating practically anything that anyone could ever want in a virtual reality experience, the OASIS is also host to Halliday's Easter Egg hunt, an odd challenge that had been released after his death. Whoever finds the Easter Egg stands to inherit the OASIS itself. The challenge has been going on for years and yet no one has found any of the three keys that were declared to be essential to the task. One such egg hunter or Gunter is 18-year old Wade Watts, known as Parzival in the artificial reality. He hopes to find the Egg to find a way to get out of the Stacks and to a better life. But for others like Art3mis (Olivia Cooke), finding the egg is essential to prevent the likes of mega corporation IOI from gaining control of the OASIS. What I Liked: The movie is obviously quite the visual treat both in terms of special effects and the sheer number of franchise characters they managed to get for this movie. The sheer number of pop culture cameos is rather staggering and of course it would take the likes of Steven Spielberg to pull everything together to make this movie a reality. But a lot of the movie feels similarly rushed in what has been a clear effort to keep a lot of different plates spinning in the air to entertain audiences. There were also a good number of changes in the movie versus the original book, particularly around the challenges. And while I rather enjoyed the challenges in the book as they largely defined the whole experience in that original text, I understand the sort of narrative thinking that lead to the changes in the movie. While at times it can seem a little self-centered that the challenges are solely are Halliday's life, the twist to things in the movie and how the challenges sort of lead to a more important personal lesson help smoothen things out. What Could Have Been Better: A lot of the action in the movie goes a little too fast for comfort and it's hard to keep up. Given all the cameos, I sort wish they made it a little easier to enjoy these cameos more as things truly blitz by in a nonsensical blur when the action really gets going. And it's hard to celebrate the movie for the pop culture extravaganza that it claims to be when most of them are too hard to spot on-screen. The character arc for Art3mis is a little better in this movie compared to the book as she plays a more important role in the solving of the puzzles. But how she gets pulled into an odd romance with Wade/Parzival still feels a little too fast or at least not quite so substantial and it doesn't hold strong under any level of scrutiny. And a lot of the High Five suffer similarly with only minimal development beyond the archetypes they try to embody. TL;DR: Ready Player One is a fun movie that can be enjoyed openly doesn't need you to scrutinize the movie with the goal of writing a paper about it after. It's loud and crazy with a lot of moving parts but in the end it's going to stay a winning piece Thus the movie gets a good 4 crazy references woven into the main narrative out of a possible 5.